Holidays bring families together, for better or worse. 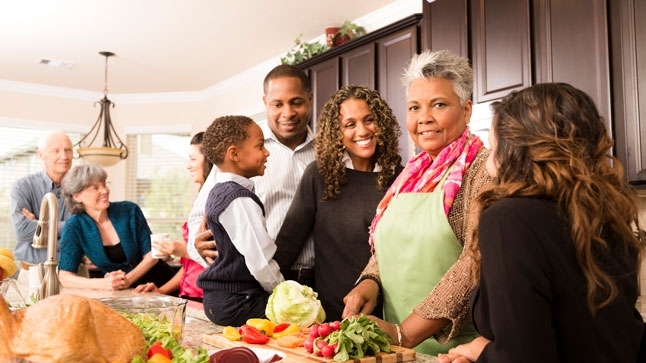 If spending time with your extended family is a recipe for stress, you’re not alone. With a bit of planning, you can take the edge off and re-focus on the positive parts of spending holidays with your family. 2. Keep them busy. A family member with a job to do has less time to test your patience. So politely ask Great Aunt Edna if she can make the gravy, while you tend to other tasks – on the other side of the room. 3. Have a snack. In a study published in the Proceedings of the National Academy of Sciences, researchers found that when people’s blood sugar levels are low, they exhibit more anger and aggression toward their spouses. To stay calm around your loved ones, don’t arrive with an empty stomach. 4. Accept relatives as they are. As much as you might like to, you can’t change other people. But you can control how you react to them. When dealing with family members, try to have empathy and imagine yourself in their shoes. At the same time, prepare yourself for feeling irritated, and try not to take it personally. 5. Avoid social media. Studies have found a link between social media use and depression. Some experts suggest that might be because social media posts give the false impression that other people are leading happier, more exciting lives than you are. Remember, people are more likely to share a picture of a glistening turkey than a video of grandma’s snide remarks about the turkey being dry. Try not to compare your holiday experience to the “perfect” holidays you see on social media. Better yet, log off and ignore the flood of forced cheer. 6. Take a timeout. If you can feel your blood pressure rising, remove yourself from the situation. Take a walk, text a friend for support or excuse yourself to a quiet room for a few deep breaths. If you have to, head home early. It’s OK to prioritize your mental health and well-being.